KAWASAKI's General Purpose Engines serve as the heart of machinery for many professionals. helping people to live more productive and enriched lives. gain the trust of professionals. we will continue our pursuit for better ways to meet the needs of our customers. The remarkable decrease in the harmful components in the exhaust gas has been achieved by adopting the stratified scavenging system. Taking all possible measures against vibration and noise and reducing the burden on the operators, this engine series is both eco- and human-friendly. The FJ Series is the subsequent version to the well-received FE Series. 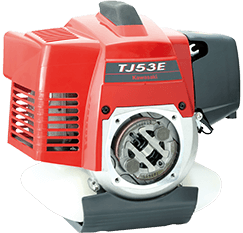 The model equipped with the two-shaft rotation balancer is able to achieve low vibration. These engines are used by diverse customers who seek high-quality, high-performance engines. The preferred engine choice of landscape professionals in the US is the Kawasaki V-Twin. The FX Series in the product line offers the highest level of durability and power. EFI versions of the FX engine were first released in 2016, using an integrated e-governor. 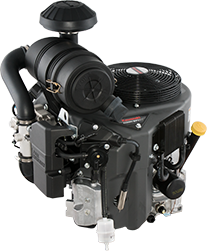 These engines help the end user be more productive, even in tough mowing conditions. The FT engine was developed with a focus on the customer's needs and requests. In 2017 our Research and Development team moved from the KMM Maryville Plant in Missouri (Kawasaki Motors Manufacturing Corp., USA*) to the Grand Rapids Michigan office (Kawasaki Motors Corp., U.S.A.**) to allow our sales support teams to better communicate our customers' voices to the R&D engineers. By collaborating closely with the sales team during development, the R&D team was able to engage directly with OEM customers. In doing so, we succeeded in accurately reflecting the requests of end users in the product development and design. 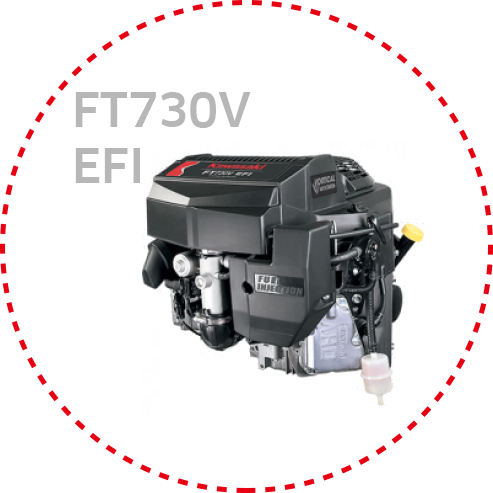 For example, the FT Series uses an integrated canister to create Vortical Air Filtration to keep the engine running cleaner, enhancing both performance and durability. 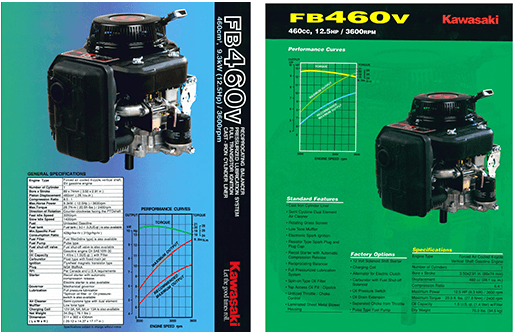 The FT series is an engine that addresses the needs of the market, without compromising quality. **Kawasaki Motors Corp., U.S.A. is Kawasaki’s US subsidiary for the Motorcycle & Engines business in the US and North American market. Aided by the trend of mechanization of agriculture in Japan, Kawasaki Aircraft decided to enter the small engine sector. Prototype #1 of our first general purpose engine, the KF4 was completed in 1956, and sales began in February 1957. The KF4 was a 4-stroke gasoline engine based on air-cooled engines developed for the aircraft industry. It was high performing and had excellent durability thanks to the design which employed cast-iron cylinders and a tunnel-type crankcase. This engine became enormously popular in the market. 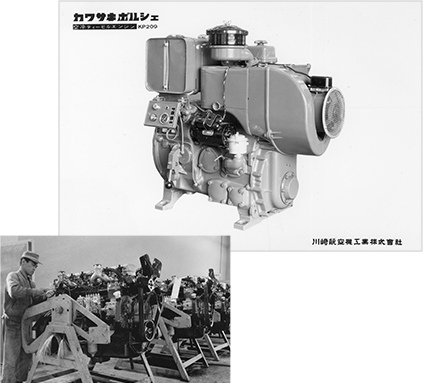 The Kawasaki air-cooled diesel engine, KP209, was released in 1962. 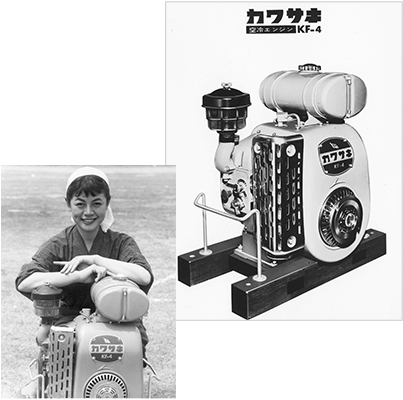 While the mainstream of the Japanese farm equipment market at that time was gasoline and water-cooled diesel engines, air-cooled diesel engines were commonly used in Europe. Therefore, a technical assistance contract was signed with Germany in expectation of future overseas sales. This was the origin of the diesel engine business and lasted until 1986. In 1968, the total number of general-purpose engines manufactured reached one million. Sales increased year by year, and the production system was developed to respond to market demand. 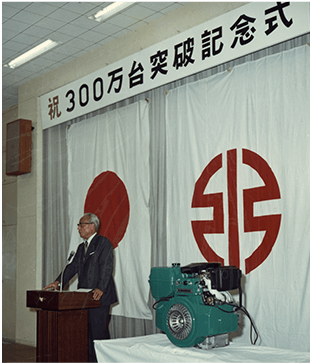 The facility dedicated to general purpose engines, Plant 28, was constructed at Akashi Works with a monthly production of 60,000 units. This plant was equipped with the latest cutting-edge installations. 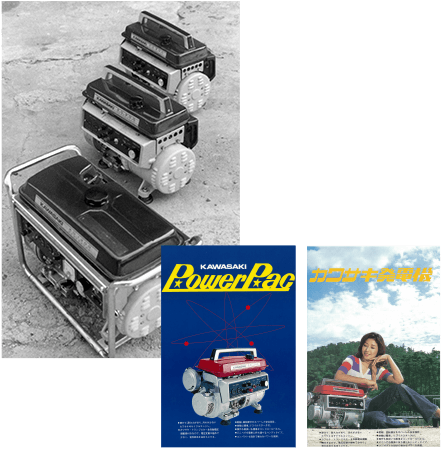 Power Products was the name we gave to the finished products powered by the KG Series engine, these included power generators, outboard motors, bush cutters, and blowers. 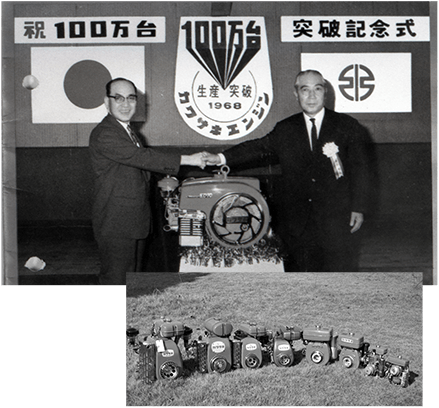 Production of the KG Series started in 1972 and turned out to be the cornerstone for Kawasaki Power Products. The subsequent model GA-type powered generator won a Good Design Award in Japan in 1985. The total number of our general-purpose engines manufactured exceeded three million. The production system had continuously been enhanced, resulting in a record annual general purpose engine production of 500,000 units in the previous year. Despite a depression in the farm equipment industry, growth was aided by our aggressive development of new products, including engines for leisure and power generation. The total number of general-purpose engines manufactured exceeded ten million, which was a record in the general purpose engine industry and was accomplished 26 years after the release of KF4 in 1957. The FB engine was developed for lawn tractors at the request of the American corporation Deere & Company. This model gained an extremely high reputation in the worldwide market. It is regarded as the predecessor of the Kawasaki V-Twin. 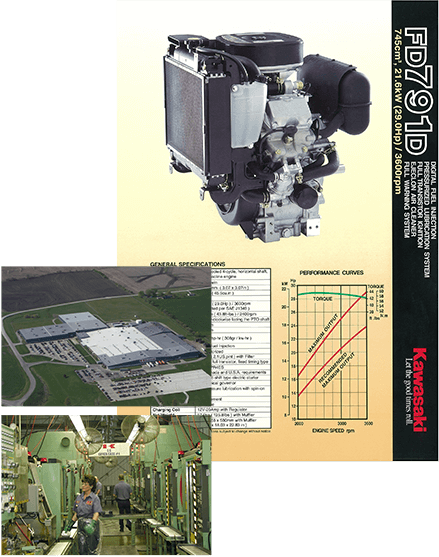 The production of general purpose engines at the Kawasaki Motors Manufacturing Corp., Maryville, Missouri plant in the United States (KMM Maryville) started in June 1989. The functions of the integrated engine production plant were installed by November of the same year, ready for the round-the-clock manufacturing. The decision to manufacture engines in the US was made to support the growth in sales which by 1989 accounted for 65% of total sales. The ability to produce these engines in the US for use in this market improved the customer satisfaction and allowed for continued growth. At this time the mainstream engine in the turf care industry in North America was an air-cooled horizontally-opposed engine. 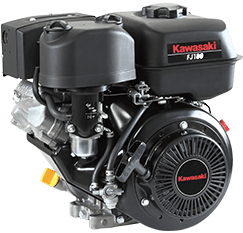 However Kawasaki decided to develop a water-cooled vertical-shaft V-Twin engine, the FD, featuring compact design, low vibration, and low noise. In the same year, Kawasaki produced 500 engines with digital fuel injection. As just described, we strive to pioneer new solutions to meet market needs. 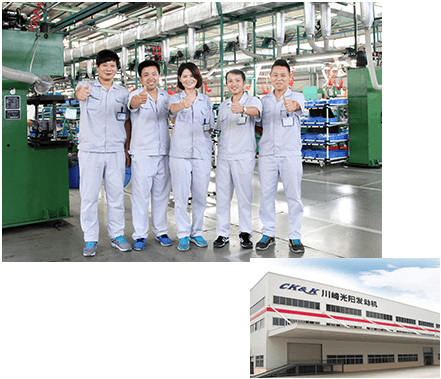 CK&K, which was a joint venture engine manufacturing company with the Taiwanese firm KYMCO, started operation. KMM mainly produced four-stroke V-Twin engines, whereas CK&K focused on two-stroke and four-stroke single-cylinder engines. Though the actual production was about 20,000 units in the initial period of operation, the production volume steadily increased later. 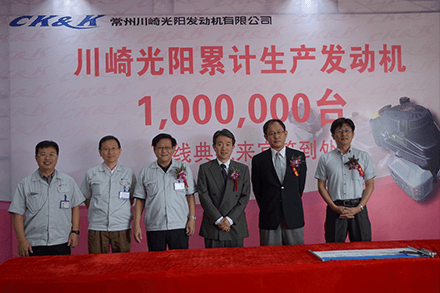 In 2015, total production reached 1 million at the CK&K plant in China. The production base, which had been at Akashi Works, gradually shifted to foreign countries with improved production environments, such as the United States and China. This transition was made in order to respond to increasingly globalized markets. In 2017, total production at KMM Maryville plant reached 10 million. Since beginning the operation in 1989, KMM Maryville plant has improved the production capacity with multiple expansions of plant buildings and improvement of operation efficiency. Engines built at KMM Maryville plant have earned a reputation of high quality and we are continuing to constantly look at ways to improve the reliability and performance of the engines. Kawasaki Heavy Industries solves the problems of people all over the world. As Kawasaki Group’s English-language quarterly newsletter, Scope showcases our diverse product groups in action on the land, on the sea, and in the air, and introduces our new, cutting edge products and technologies.